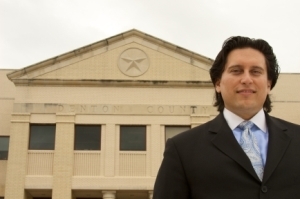 Derek A. Adame has represented citizens accused of criminal offenses in Denton County since 1998. He has served clients in a number of high profiled cases and has been interviewed by several media outlets, including the Dallas Morning News, Denton Record Chronicle, Dallas Observer, NBC 5, and Univision. Derek has also served as guest lecturer at the University of Texas at Dallas, the University of North Texas, and Texas Woman's University. He also served as Lead Counsel in a murder case featured on the A&E Television Network's popular "The First 48" series. In addition, Mr. Adame has served as Lead Counsel in hundreds of criminal cases and jury trials. Derek is a former prosecutor with the Harris County District Attorney's Office from 1994 to 1996. During that time, he served as a Special Prosecutor for Family Violence Offenses and Chief Prosecutor for DWI offenses. He was lead counsel in hundreds of criminal prosecutions and also educated police officers in family violence, DWI, and drug offenses. He understands the juridical system from every perspective and uses this knowledge to his client’s advantage. His time as a prosecutor has also better equipped him when dealing with prosecutors, judges, and juries. Don’t entrust your defense to just any attorney, find a Denton criminal defense attorney who has specialized, legal experience and proven results. If you are looking for experienced legal representation that is both creative and aggressive, then Derek A. Adame, Attorney at Law is prepared to assist you with your legal defense. Schedule a free, initial case evaluation with our law office today so we can begin working on your defense strategy. Contact Attorney Derek A. Adame today!